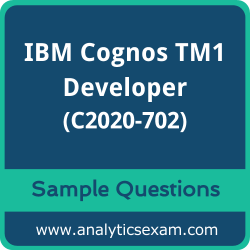 Here are the sample questions which will help you be familiar with IBM Certified Developer - Cognos TM1 10.1 (C2020-702) exam style and structure. We encourage you to try our Demo IBM Cognos TM1 Developer Certification Practice Exam to measure your understanding of exam structure in an environment which simulates the IBM Cognos TM1 10.1 Developer Certification test environment. To make your preparation more easy for IBM Cognos TM1 10.1 Developer (C2020-702) exam, we strongly recommend you to use our Premium IBM Cognos TM1 Developer Certification Practice Exam. According to our survey with certified candidates, you can easily score 85% in your actual IBM Certification exam if you can score 100% in our premium IBM Cognos TM1 Developer Certification practice exams. Q 2: Which settings in the tm1s-log.properties file would maximize the information produced using TI processes while keeping other log information to a minimum? Q 3: You are developing a TM1 model for a city aquarium and need to add a new sub-category of animals to the Animal dimension. The new elements are: Amphibians, Frog, and Salamander. Assume that Amphibians is the parent of Frog and Salamander and you want the children to automatically roll up to the parent. Which weighting and element type will you assign to each element? Q 4: You are planning a customer installation with several TM1 servers, all with Integrated Security Mode 4 and a common Cognos BI service. Security groups are common between all TM1 servers. Where do you maintain groups and users to minimize administrative tasks? Q 5: You develop a worksheet with drop down menus displaying subset information. You want to ensure that after the worksheet is opened, all of the subsets are automatically refreshed and up-to-date with the latest server changes. Which workbook level named variable would you use? Q 6: You have a cube that is showing slower than expected query response times. Which strategy would you pursue to improve query performance? A: Reorder the cube dimensions using the Cube Optimizer. B: Run the query through TurboIntegrator. C: Create a named view on the cube. D: Apply cell security to the cube. Q 7: You need the current month as a number. Which function delivers the desired result? Q 8: You need to export data from a TM1 cube including the column headers. In which two could you put the ASCIIOutput command for the column headers? Note: Please write us on feedback@analyticsexam.com if you find any data entry error in these IBM Cognos TM1 10.1 Developer (C2020-702) sample questions. There are currently 60 users and 356 guests online.